Virtual Reality is a created simulated environment by using computer technology. Most people will relate virtual reality with the head mounted display like the oculus rift, playstation vr, and htc vive. Unlike traditional user interfaces, VR places the user inside an experience. Instead of viewing a screen in front of you, users are immersed and able to interact with the 3D world. 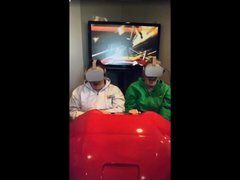 Our VR Roller Coaster Experience offers more than 20 scenerios, along with vibration system and sounds. The software and hardware developed for this coaster allows it to have a sychronized system of vibration, and ventrilation with the scenerio of the ride you chose. You will actually feel like were in a real roaster coaster at speeds on some of the rides of up to 120km/h.